i may have tried 90% of the desserts that trader joe’s offers. i just love sweets and tj’s (can i call it tj?) has a great assortment. the ice cream bon bons definitely makes my top 10 list. i love the bite size helping which makes me not feel as guilty (around 100 calories for each bon bon) , the brownie layer at the bottom and the perfect ratio of chocolate to vanilla. you guys these are seriously heavenly. b always makes fun of me when i buy these. but he just doesn’t get how delicious the bon bons are. he doesn’t get that i love ice cream treats more than i love most people. he doesn’t get that one bon bon can turn my day upside down. but you know who does get it? trader joe’s. tip! don’t be fooled by the lemon bars located next to the bon bons. trader joe’s does not sort by best frozen treats to worst. those lemon bars are not worth the calories. i bought them once and was incredibly disappointed by the lack of flavor. yes, i do expect my lemon bars to be tart and have a strong lemon taste. maybe that is my bad. and maybe i have just been spoiled by my mom’s and ina’s lemon bars. oh well tj, you can’t win them all. 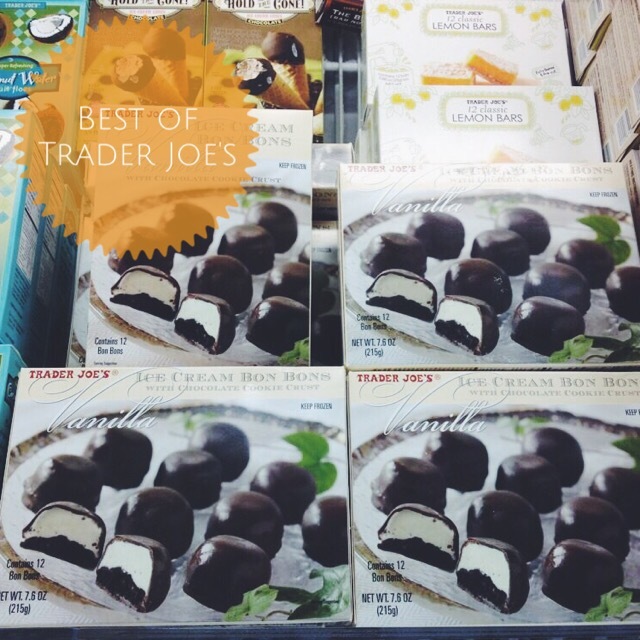 This entry was posted in Bites + Sips and tagged ice cream bon bons on 02/24/2015 by Ems.